It’s been a little over six years since the government in China approved and put into action Standard GB/T 22111-2008 which limited labeling teas as “pu-erh” (or pu’er, pu’erh, pu-er, etc.) to a certain geographical area (Yunnan Province, China). The hotly contested standard has seemingly done little to keep other teas from being sold as pu-erhs. Not surprising since the worldwide demand is increasing. Even if they wanted to, the tea farmers in Yunnan would very likely not be able to keep up with that demand. The scope of the standard: “This standard stipulates the geographical indication product pu-erh scope of protection of geographical indication products, terms and definitions, types and grades, requirements, test methods, inspection rule and marks, packaging, transportation and storage.” Basically, just as for Darjeeling teas, the standard says only tea produced in Yunnan’s 639 towns in 11 prefectures and cities, including Pu’er and Dali, can be called pu-erh tea and that the tea can only be made from a large leaf variety of the plant growing in the defined area that is then processed using a specified technology. Other locations producing pu-erh like tea could no longer call it pu-erh, plus all pu-erh being sold after 30 June 2009 had to have a geographical indicator that is was from Yunnan Province. According to Yunnan Province Standards for Puerh, DB53/103-2003, the raw materials come from “Yunnan big-leaf tea tree cultivars grown in certain regions of Yunnan. 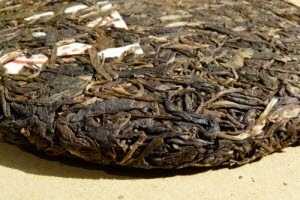 The leaf materials are sun-dried and processed with post-fermentation to become loose tea or compressed tea…” The processing probably includes both wo dui and natural fermentation during storage. 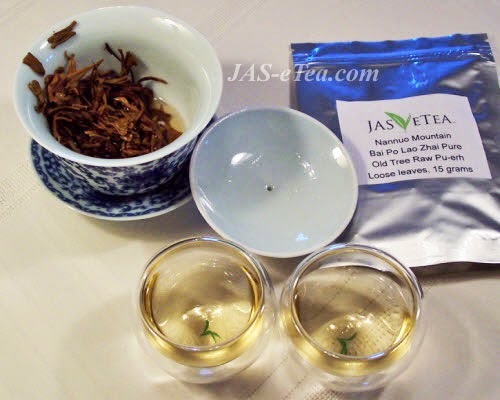 The full definition leaves open the suggestion that young sheng is not true pu-erh and that aged sheng becomes shu after aging a certain number of indeterminate years (some say as few as eight and others a minimum of 15). So, perhaps a better definition needs to be sought. A new version of these standards was dated in 2006, including the proposed geographic designation, the terms “sheng” and “shu” more clearly defined, as well as defining young sheng as pu-erh. Phew! That’s better! And this definition became part of National Standards for Puerh, GB/T22111-2008. Oddly, the definition most often used comes from Dayi Group, which states that, despite there being different characters for new sheng and new shu, they taste very similar after 10 to 15 years and so are not that different (a matter that is open to much debate but a reason that some want to call older sheng as “shu”). Their definition does not recommend renaming the teas, though, and therefore avoids two confusions: 1) how to label the teas at the time they are pressed, and 2) no need to relabel the cakes as the teas age, since sheng remains sheng no matter how long stored as does shu (unlike the other definitions that refer to aged sheng as shu). About a year after Standard GB/T 22111-2008 went into effect, the tea farmers and producers in Guangdong Province, which borders Yunnan, started to voice objections. A speculative bubble in pu-erh had inflated prices above the cakes’ weight in gold (a similar action now ongoing with some Darjeeling teas) but had burst around the time the standard went into effect. Prices fell by about 85%, shattering the hopes of many in both provinces and sparking a battle over the standard (approved on 5 August 2008 by General Administration of Quality Supervision, Inspection and Quarantine). 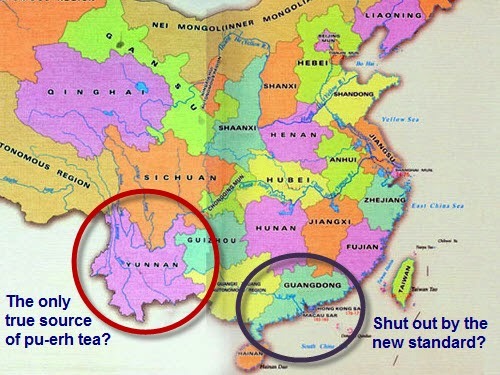 Plus, Guangdong producers were dealt the additional blow of being unable to sell their teas as pu-erhs. Zhang Liming, secretary general of Guangdong Tea Procession Association, spoke out about the economic disaster this would cause in the province, comparing it to calling rice grown in one province by another name than rice grown in another province. Of course, this leaves out all of the work processing the tea leaves, processing that is not involved in the rice. But the point is clear. Is the tea processed in Yunnan really so unique that a line on a map means it has to have a special name? And if so, why claim “pu-erh”? I’m thinking it’s partly due to the town of Pu’er where the tea is said to have originated. Not sure that is sufficient justification, plus it is refuted in an academic paper by professor Ding Junzhi from South China Agricultural University, stating that Guangdong was one of the earliest places to process pu-erh tea. Zhang called on the China Tea Marketing Association and the Economic & Trade Commission of Guangdong Province to help overturn the standard. Yang Shanxi, director of the Yunnan Tea Industry Office, sees nothing new in this protectionist move and assures that it is supposed to help consumers know they are buying and drinking authentic pu-erh tea. When prices were soaring, tea leaves from Fujian and Sichuan provinces or from nearby Vietnam and Myanmar (Burma) were made into cakes labeled as pu-erh. 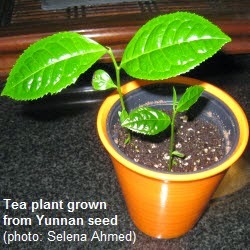 In 2005, things got more contentious when the Yunnan Tea Business Association publicly accused Guangdong tea producers of selling too much of what they called “counterfeit pu-erh.” And such geographic designations have been issued for other products, including the Pinggu big peach, Longjing tea, the Shaanxi apple and the Guanxi honey pomelo. Only tea produced in Xihu, Qiantang and Yuezhou of Zhejiang province can be called Longjing. A bit of confusion arises over the cultivars used for making pu-erh tea. They are Camellia sinensis variety assamica and are collectively called “large-leaf” by the trade in China. They have larger leaves and buds than most other cultivars grown in China. Some have been cross-cultivated with Camellia sinensis variety sinensis and are grown on farms for various teas. The name “assamica” can be confusing, with people associating it with teas from the Assam state in northern India. About 150 years ago taxonomists named the varietal not knowing it has been around and cultivated in many parts of southwest China and northern Indo-China peninsula. They could even have been grown for millennia before that. The true issue, though, isn’t the name. It’s the claim that only leaves from tea plants grown in the Yunnan province can make authentic pu-erh tea. While terroir can certainly play a role in tea flavor, the processing of these leaves, especially their fermentation (whether natural or using wo dui), would seem to make even more of a difference. So, maybe Zhang Liming is right in her thinking. 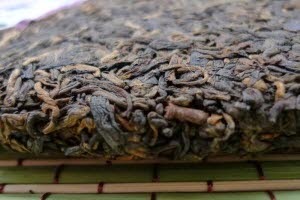 The bottom line for me, as both a vendor and pu-erh drinker, is pu-erh that satisfies both you and me. This standard seems to assure for the most part where the tea leaves are grown and processed, but also assures that a particular process is used and that the teas are properly stored. I’m not clear on who exactly confirms that this standard is met, but my sources always know that what they supply to me meets it. As far as I’m concerned, therefore, the customer wins.